Nakamoto is currently Chairman of Amour, LLC, and Chairman of InterAmerica Global, both involved in international exports. He was former Chairman and principal owner of Base Technologies Inc., McLean, VA, a long time information technology company. Prior to that he was Director of Corporate System, MCI, Deputy Commissioner for Planning for the state of Texas (Honorary Texas Citizen), Director for Planning of Medicare and Medicaid Programs in the Federal Government, and positions in California state and local governments. He has served on Presidential Task Force for both parties. He received the coveted Japan’s Foreign Minister Award in recognition of his efforts to enhance Japan-US relations. He was born in California, graduated from California State University and is a veteran of the Korean War. 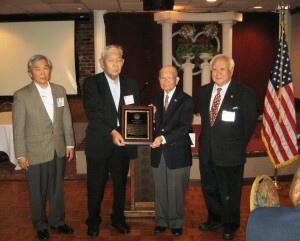 Guests at the luncheon included the Honorable Norman Mineta, a Korean War Military Intelligence Service veteran, former Secretary of Transportation, and Honorary Chair of JAVA, Brigadier General and Mrs. Anthony J. Cotton, US Air Force, Deputy Director of the National Reconnaissance Office (NRO), and JAVA life members Lieutenant Colonel Claude “Chip” Larouche, Major Setsy Sadamoto Larouche both of Portland, Oregon, and Colonel Mark Nozaki, USA. 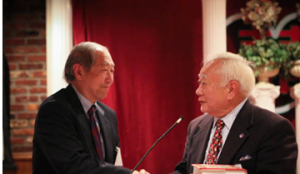 Ujifusa recalled that Masaoka was a “single most gifted leader in American history…he could think, speak and act with great precision and compelling force…a big time problem solver” and as good a lobbyist as the best in Washington.” Ujifusa provided examples to support these statements. While at Random House in New York, Ujifusa edited a book, “The Politics of Inclusion,” by Thomas Kean, who, was the Governor of New Jersey. After contacting the Governor Kean, Ujifusa was told that the President was coming to New Jersey to campaign for Republican state legislative candidates in October, 1987. Kean readily agreed to bring up redress with the President during his political swing through New Jersey when he briefed the President on HR 442. On one 35-minute trip together between campaign stops, Governor Kean discussed redress and produced a letter from Kaz Masuda’s sister, June, to the President that reminded the President of his 1945 speech at Kaz Masuda posthumous award ceremony. President Reagan subsequently called Governor Kean and said, “I remember that day at the ceremony for Kaz Masuda. I think redress is something I want to do.” On August 10, 1988, in a ceremony attended by over 100 Japanese Americans and members of Congress, Ronald Reagan first re-read the same words he had said at Kaz Masuda’s posthumous award ceremony 43 years before – and then he proceeded to sign the bill.